2-star-hotel in the 2nd district of Budapest. 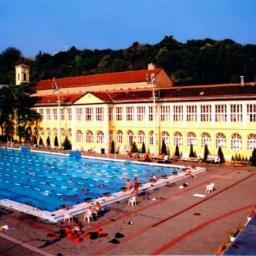 Address: 1023 Budapest, Frankel Leo u. 35. Hotel Csaszar is situated 500 meters from Margaret Bridge, in the centre of the city, on the Danube bank. This means that the guests of Hotel Császár can reach Margaret Island in ten minutes by foot. The hotel can be reached from downtown very conveniently day and night by means of public transportation. The hotel shares the building of the Komjádi-Császár swimming pools. The 45 rooms of Hotel Császár, which are two- and four-bedded rooms with a shower, as well as its connecting family rooms, can be fitted with extra beds, which makes it possible for the hotel to house 110 guests at the same time. Each room of Hotel Császár is installed with air-conditioning, a mini bar, satellite TV and a telephone. Guest's clothes and luggage can be comfortably packed into the spacious wardrobes, which are equipped with mirrors. In the spacious apartment, there is a separate living room, a bedroom, a bathroom, a kitchen and a dining room, which even makes it possible for guests to hold small meetings as well.